A peculiar romance drama, A Dangerous Woman attempts to explore some relatively original territory but fails to coalesce. 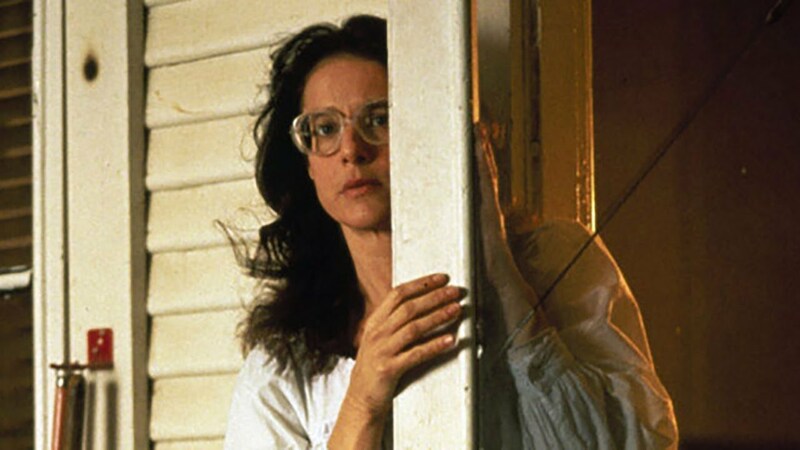 Martha (Debra Winger) is a socially and physically awkward and lonely woman, able to function by herself but suffering from some form of mental illness. She lives in a guesthouse next to her aunt Frances (Barbara Hershey), who is carrying on an affair with aspiring politician Steve (John Terry), who in turn is married to the alcoholic and potentially violent Anita (Laurie Metcalf). Martha is fired from her job at a laundromat, wrongly accused of a petty theft actually committed by sleazy co-worker Getso (David Strathairn). Meanwhile handyman drifter Mackey (Gabriel Byrne) shows up to repair Frances' porch. Hunky but frequently drunk, Mackey forges an unusual bond with Martha, who is having trouble letting go of the injustice perpetuated by Getso. 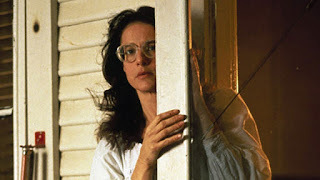 Directed by Stephen Gyllenhaal (and featuring his kids Jake and Maggie in tiny roles), A Dangerous Woman features a terrific Debra Winger performance and little else. Martha's behaviour often falls just outside the normal range, causing her no end of grief, and Winger immerses herself into the quirky mannerisms of a woman-child who has difficulties engaging in the logic of the adult world. The performance tugs at the heartstrings of sympathy and is almost aching in its sustained intensity. Everywhere around Winger, the film falls short. An adaptation of a novel by Mary McGarry Morris, the story meanders along irrelevant pathways and fails to set a direction. The entire subplot featuring Frances, the politician Bell and his highly-strung wife Anita drops in and out of the film and goes exactly nowhere. Character depth, motivation and evolution is fundamentally lacking, and time passes very slowly with plenty of repetitive drunken episodes featuring Byrne stumbling about. A late incident of violence is followed by an unsatisfactorily pat resolution. The film does wade into the thorny territory where the nature of sexual consent can be debated. Multiple impairments come together to give Martha both unexpected pleasure and a downstream conundrum. It's an interesting question but arrives too late and is almost entirely bypassed by the Naomi Foner script. Stephen Gyllenhaal has spent most of his subsequent directorial career in television territory, and A Dangerous Woman has the small-time look and truncated sophistication of an episode from the third season of tired network series. One woman gives her all, but all else is dangerously stale and familiar.